The kitchen staff plays an extremely important role in the restaurant industry. Without a diligent and efficient kitchen staff your restaurant is doomed to fail. It is important, then, for your kitchen staff members to fully understand their responsibilities and work together as a team. Because the workload in a kitchen is too large for one person, you must know how to not only delegate tasks to the kitchen staff but also how to foster an attitude of collective concern for creating great food. Every kitchen staff should have stringent standards and regulations for washing hands. Washing hands before preparing food is extremely important because it helps ensure the quality of the food as well as prevent the spread of pathogens. 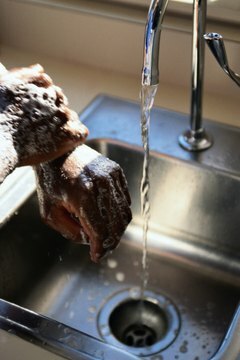 Many restaurants require kitchen staff to wash their hands at regular intervals such as once every hour in addition to requiring them to wash their hands any time they touch their faces. Kitchen staff must prepare many foods, sauces and other items in advance. If a restaurant decides to serve eggs Benedict for brunch, for instance, staff members must make Hollandaise sauce prior to the start of brunch. Important ingredients for cooking like beef stock and chicken broth, for example, take at least a day to prepare. Marinades often take more than several hours to imbue the meat with flavor. Many kitchens post in a visible place a checklist that assigns food preparation responsibilities whereby kitchen staff check off the duties that they have fulfilled. The chef or sous chef must prepare a menu for the restaurant. This includes more than selecting ingredients, choosing dishes and designing presentations. It also means that a chef or a designated member of the kitchen staff must be responsible for sending and receiving the orders to get the proper ingredients. To ensure the freshness and overall quality of the food, many restaurants send and receive daily food orders. The chef or a designated kitchen staff member must be responsible for scheduling other members of the kitchen staff. This person must have the ability to juggle competing scheduling requests of staff members with the staffing needs of the restaurant. For instance, for most restaurants, Friday and Saturday nights are exceptionally busy. The kitchen staff scheduler must heed the need for extra line cooks or dishwashers on these busy nights. Mack, John. "Checklist for Kitchen Staff in a Restaurant." , https://careertrend.com/info-8533269-checklist-kitchen-staff-restaurant.html. 05 July 2017.